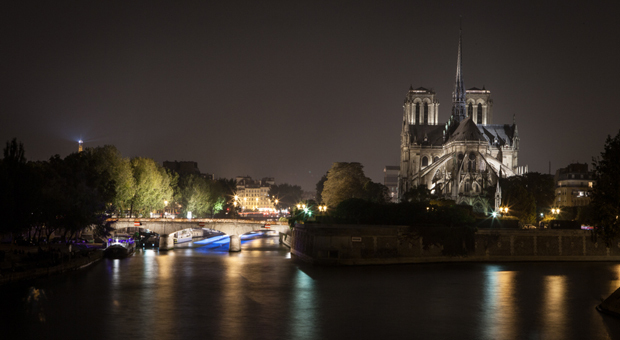 A Bolt of Blue | Paris by bike…at NIGHT! I first came across Fernanda Hinke‘s website, My Life On My Bike a year or so ago. Fernanda is a Brazilian who is currently living in Paris. She rides her bike around reporting on street art. Now you know how I found her site! Her recent post was so utterly lovely that I had to share it. One gorgeous spring night Fernanda was invited to a party on a boat along the Seine. She donned her black dress, and flats (her heels were tucked away in her purse for later) and rode her bike to the soiree. She staggered out many hours later and started her ride home through the starlit streets of Paris. Something magical occurred on her way home…she couldn’t believe how gorgeous the city was, and that a whole other universe was suddenly surrounding her. Biking at that area wasn’t something new for me, but, after the great party and good glasses of champagne, it was time to come back home. The clock was beating 1 am, the streets were completely empty, the city was asleep and silent. However, the lights of the monuments were still alight and the moon, ahh the moon, it was a full moon, bright and mysterious, unforgettable. At that moment, I had an insight: what kind of Paris is that? A strong emotion for been biking in the city of lights at that time, a feeling that everyone was missing something while sleeping instead of absorbing the magic Paris at dawn. A nostalgic sensation exploded in my heart. I felt exactly like in Woody Allen’s “Midnight in Paris” film, reviving moments of the past century, also inside the pictures captured by the photographer Brassai, who immortalized the Parisian night in the 30s. It was a singular beauty, Paris was calm, Orphic, sepia… a sensation that Paris was just mine…..
During many days, I couldn’t stop thinking about that fantastic spectacle. The yellow lights reflecting on the water of the Seine River and illuminating my impeccable path, full of “street art” in each corner. Days after, I decided to repeat the rout, biking from my home (at that time in the neighbourhood of Le Marais) until the Eiffel Tower and then came back, with the prerequisite: it had to be late, very late at night. For my surprise, the emotion repeated, even if it was not an unprecedented path, the sensation was exactly the same. Then I discovered that the alchemy was in the recipe: Paris+ Bike + Midnight. Spontaneously, I had created the tour: Midnight in Paris by bike. The best part about this story is that Fernanda wanted others to feel what she was feeling on that bike late at night. 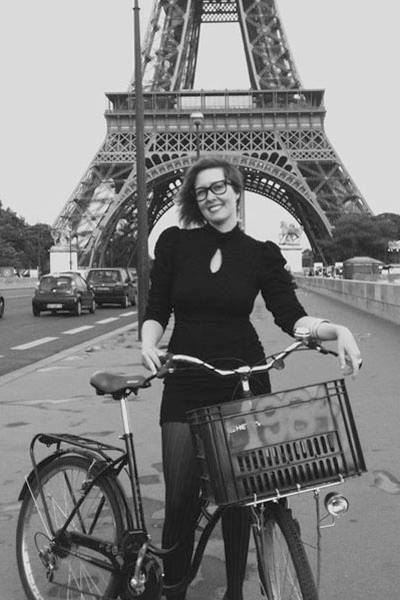 In partnership with Conexao Paris, she created her very own bike tour of Paris. 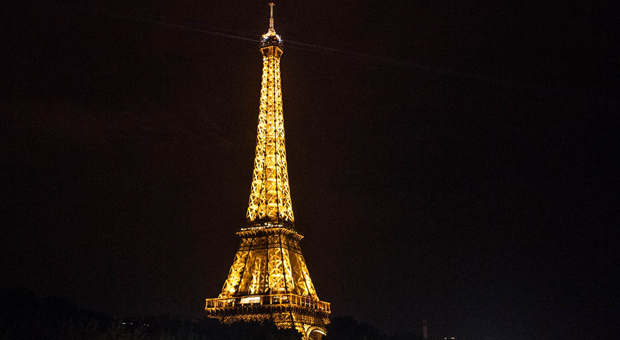 One that starts at 8 pm, and ends ceremoniously with a glass of champagne at the Eiffel tower, at midnight…just as the lights start to twinkle….pure MAGIC! So, if you’re planning a trip to Paris in the spring or summer (tours start in March)…be sure to book a tour with Fernanda!